The pathogenesis of Helicobacter pylori (H. pylori) infection-induced duodenal ulcer remains to be elucidated. Duodenal mucosal bicarbonate secretion is the most important protective factor against acid-induced mucosal injury. We previously revealed that H. pylori infection downregulated the expression and functional activity of duodenal mucosal cystic fibrosis transmembrane conductance regulator (CFTR) and solute linked carrier 26 gene family A6 (SLC26A6) which are the two key duodenal mucosal epithelial cellular bicarbonate transporters to mediate duodenal bicarbonate secretion. In this study, we investigated the mechanism of H. pylori infection-induced duodenal CFTR and SLC26A6 expression downregulation. We found that H. pylori infection induced the increase of serum transforming growth factor β (TGFβ) level and duodenal mucosal TGFβ expression and the decrease of duodenal mucosal CFTR and SLC26A6 expressions in C57 BL/6 mice. The results from the experiments of human duodenal epithelial cells (SCBN) showed that H. pylori increased TGFβ production and decreased CFTR and SLC26A6 expressions in SCBN cells. TGFβ inhibitor SB431542 reversed the H. pylori-induced CFTR and SLC26A6 expression decreases. The further results showed that TGFβ directly decreased CFTR and SLC26A6 expressions in SCBN cells. TGFβ induced the phosphorylation of p38 mitogen-activated protein kinase (MAPK) and P38 MAPK inhibitor SB203580 reversed the TGFβ-induced CFTR and SLC26A6 expression decreases. H. pylori infection downregulates duodenal epithelial cellular CFTR and SLC26A6 expressions through TGFβ-mediated P38 MAPK signaling pathway, which contributes to further elucidating the pathogenesis of H. pylori-associated duodenal ulcer. Duodenal ulcer is a common disease in the digestive tract [1, 2]. It has been demonstrated that Helicobacter pylori (H. pylori) infection is main etiologic agent responsible for duodenal ulcerogenesis [1, 3, 4]. In spite of extensive studies, the pathogenesis of H. pylori infection-induced duodenal ulcer remains to be elucidated. Duodenal mucosal bicarbonate secretion is the most important protective factor against acid-induced duodenal mucosal injury [5, 6]. A clinical study showed that there was significant diminished duodenal mucosal bicarbonate secretion in the patients with H. pylori-associated duodenal ulcer in comparison with healthy controls, and duodenal mucosal bicarbonate secretion returned to normal levels after the eradication of H. pylori . The studies from animal experiments showed that intraluminal perfusion of H. pylori water extract inhibited acid-stimulated duodenal mucosal bicarbonate secretion in rats . Prostaglandin E2 (PGE2)-stimulated murine duodenal mucosal bicarbonate secretion in vitro was also strongly inhibited by water extract from cytotoxin-associated gen A (CagA) /vacuolating cytotoxin A (VacA)-positive H. pylori strains . These studies suggest that the effect of H. pylori on duodenal mucosal bicarbonate secretion might be involved in the pathogenesis of H. pylori-associated duodenal ulcer. However, the mechanisms whereby H. pylori influences duodenal mucosal bicarbonate secretion are not completely understood. Duodenal mucosal bicarbonate secretion is mediated by bicarbonate transporting proteins located in duodenal mucosal epithelial cells. The cystic fibrosis transmembrane conductance regulator (CFTR) and solute linked carrier 26 gene family A6 (SLC26A6) are the two key bicarbonate transporting proteins of duodenal mucosal epithelial cells and they play important role in the regulation of duodenal mucosal bicarbonate secretion [10–12]. We previously showed that H. pylori infection downregulated the expression and functional activity of duodenal mucosal CFTR and SLC26A6 , which contributes to the development of duodenal ulcer. In this study, we investigated the mechanism of H. pylori infection-induced duodenal CFTR and SLC26A6 expression downregulation. We hope to further elucidate the mechanisms whereby H. pylori infection influences duodenal mucosal HCO3− secretion and the pathogenesis of H. pylori infection-induced duodenal ulcer. Prostaglandin E2 (PGE2) and forskolin were purchased from Sigma. pH-sensitive fluorescent dye, 2′,7′-bis(2-carboxyethyl)-5(6)-carboxy-fluorescein acetoxymethyl ester (BCECF-AM), was from Invitrogen. Anti-CFTR, anti-SLC26A6, anti-P38, anti-phospho-P38, and anti-β-actin antibodies were from Santa Cruz. All other chemicals in solutions were obtained from Sigma and Calbiochem. H. pylori strain (ATCC 43504), from the H. pylori Strain Pool, Beijing, China, was verified to be cytotoxin-associated gen A (CagA)- and vacuolating cytotoxin A (VacA)-positive previously  and used throughout the experiments. The CagA and VacA s1/s2 and m1/m2 genotypes of the H. pylori strain were further confirmed by specific polymerase chain reaction (PCR) as described previously by Miernyk et al. . The H. pylori strain was routinely cultured for 48 h on Brucella agar plates containing 5% sheep blood at 37 °C under microaerophilic conditions in a humidified CO2 incubator (Thermo Fisher Scientific, Wilmington, DE) and then used for experiments. Male C57 BL/6 mice of 6 to 8 weeks from Shanghai Animal Center (Chinese Academy of Science, Shanghai, China) were used in this study. The animal experiments were approved by the Experimental Animal Ethics Committee of Zunyi Medical College and conducted in accordance with principles stated in the Guide for the Care and Use of Laboratory Animals (NIH publication 8623, National Institutes of Health, Bethesda, MD, 1985). The mice were housed in the experimental animal facility with specific pathogen free (SPF) of Zunyi Medical College under standard care conditions. 60 mice were used for H. pylori infection experiments and 10 mice were used as controls. After a week of acclimatization, the mice were orally gavaged with 0.5 ml H. pylori suspension in Brucella broth (1 × 109 CFU/ml) once daily for 4 consecutive days. The control mice were only gavaged with sterile Brucella broth. The mice were sacrificed by cervical dislocation under CO2 narcosis at 4 week after last gavage. Blood samples were quickly obtained by cardiac puncture for serum transforming growth factor β (TGFβ) level examination. The gastric antrum tissues were used for H. pylori infection examination. The duodenal mucosal tissues were used for examination of CFTR and SLC26A6 mRNA and protein expressions and TGFβ mRNA expression. The presence of H. pylori in the stomach was determined by Giemsa-stained sections. H. pylori-negative was defined when Giemsa staining was determined to be negative by visual observation, and H. pylori-positive was defined when positive Giemsa staining was observed. H. pylori infection density was assessed by semiquantitative analysis of H. pylori levels in the gastric mucosa (+, less than 10 bacteria per gland; ++, 10 to 20 bacteria in at least one gland; +++, 20 to 30 bacteria in at least one gland; ++++, more than 30 bacteria in at least one gland). SCBN (a gift from Dr. Hui Dong in University of California San Diego) is a nontumorigenic duodenal epithelial cell line obtained from a human patient . SCBN cells were maintained in Dulbecco’s modified Eagle’s medium (DMEM) supplemented with 10% fetal calf serum and 50 mg/ml penicillin-streptomycin for two days. Then 5 × 106 SCBN cells were seeded on six-well plates and grown at 37 °C in a 5% CO2 atmosphere. Prior to infection, each well was washed twice in 1 ml of antibiotic-free cell culture medium. Then H. pylori was added to the cultured cells at different multiplicity of infection (MOI). After incubation for 24 h at 37 °C in a 5% CO2 atmosphere, the cells were harvested for examination of CFTR and SLC26A6 protein expression levels. The supernatants were for examination of TGFβ concentration. For intracellular pH measurement, SCBN cells were grown on 12-mm round coverslips and then incubated with H. pylori at a MOI value of 400 for 24 h. In addition, an uninfected control was included in each experiment. For the measurement of serum TGFβ concentration, after blood was quickly obtained by cardiac puncture, the blood sample was centrifuged immediately at 3000 rpm for 5 min for collection of serum. The serum sample was stored at − 20 °C and analyzed within one week. Serum TGFβ level was detected by using the enzyme-linked immunosorbent assay kit (ELISA) (TGFβ1 Mouse Uncoated ELISA Kit, Invitrogen, USA, Cat. No. 88–50,690-22) according to the manufacturer’s instructions. TGFβ level in supernatant of H. pylori-infected SCBN cells was detected by using TGFβ1 Human Uncoated ELISA Kit (Invitrogen, USA, Cat. No. 88–50,390-77). Total RNA extract of murine duodenal mucosal tissues and quantitative real-time reverse transcription PCR analysis were performed as described previously . The mRNA expression level of CFTR, SLC26A6, or TGFβ was normalized to that of β-actin and was expressed as a ratio relative to β-actin. The primers were as follows: CFTR, forward 5′-AAGGCGGCCTATATGAGGTT-3′ and reverse 5′-AGGACGATTCCGTTGATGAC-3′; SLC26A6, forward 5′-GGTGGTGAAGCTGTTGAATGAC-3′ and reverse 5′-ATGTTGCCCACGACATCTACCTC-3′; TGFβ, forward 5′-ATACGCCTGAGTGGCTGTC-3′ and reverse 5′-GCCCTGTATTCCGTCTCCT-3′; β-actin, forward 5′-CTGCCTGACGGCCAAGTC-3′ and reverse 5′-CAAGAAGGAAGGCTGGAAAAGA-3′. Murine duodenal mucosal tissues or SCBN cells were homogenized in lysis buffer at 4 °C and western blot analysis was performed as described previously . Anti-CFTR, anti-SLC26A6, anti-P38, anti-Phospho-P38, or anti-β-actin (served as internal control) was used as primary antibody. The results were expressed as the ratio relative to β-actin. Bicarbonate secretion in SCBN cells was determined through the measurement of intracellular pH [pHi] by using pH-sensitive fluorescent dye BCECF-AM as described previously . When forskolin or PGE2 was used, forskolin (10 μM), PGE2 (1 μM), or control was added into solution. Stimulated duodenal epithelial cellular bicarbonate secretion was to stimulated peak pHi value minus basal pHi value and expressed as ∆pHi. Statistical analysis was processed by using the SPSS PC statistic package. All results are expressed as means ± standard errors (SE). Data were analyzed by one-way analysis of variance (ANOVA) followed by Newman-Keul’s post-hoc test or, when appropriate, by the two-tailed student t tests. P < 0.05 was considered statistically significant. We first established H. pylori infection model in mice. Among 60 experimental mice, 19 (31.67%) were H. pylori (−), 17 (28.33%) were H. pylori (+), 11 (18.33%) were H. pylori (++), 8 (13.33%) were H. pylori (+++), and 5 (8.33%) were H. pylori (++++). The results from PCR and western blot analyses showed that the mRNA and protein expressions of duodenal mucosal CFTR and SLC26A6 in the mice with H. pylori (−) and (+) were not altered in comparison with controls, but there were markedly decrease in the mice with H. pylori (++), (+++), and (++++). 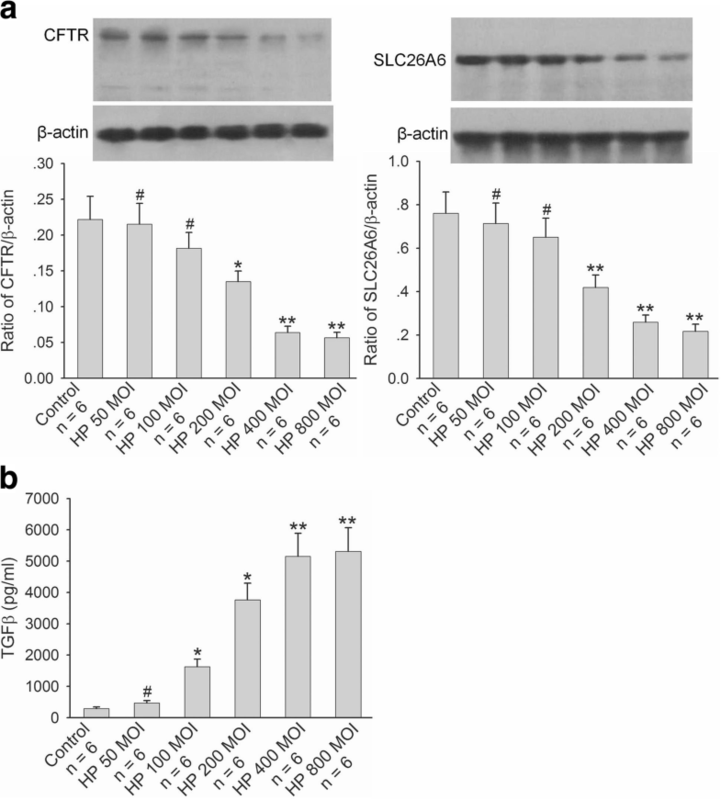 The mRNA and protein expressions of duodenal mucosal CFTR and SLC26A6 were decreased with the severity of H. pylori infection (Fig. 1a and b). The further results showed that duodenal mucosal TGFβ mRNA expression in the mice with H. pylori (−) and (+) was not altered in comparison with controls and there were markedly increase in the mice with H. pylori (++), (+++), and (++++). The duodenal mucosal TGFβ mRNA expression was increased with the severity of H. pylori infection (Fig. 1c). H. pylori infection in the mice also induced serum TGFβ concentration increase. The change of serum TGFβ level was in consistent with the change of TGFβ expression in duodenal mucosa and serum TGFβ level was also increased with the severity of H. pylori infection (Fig. 1d). 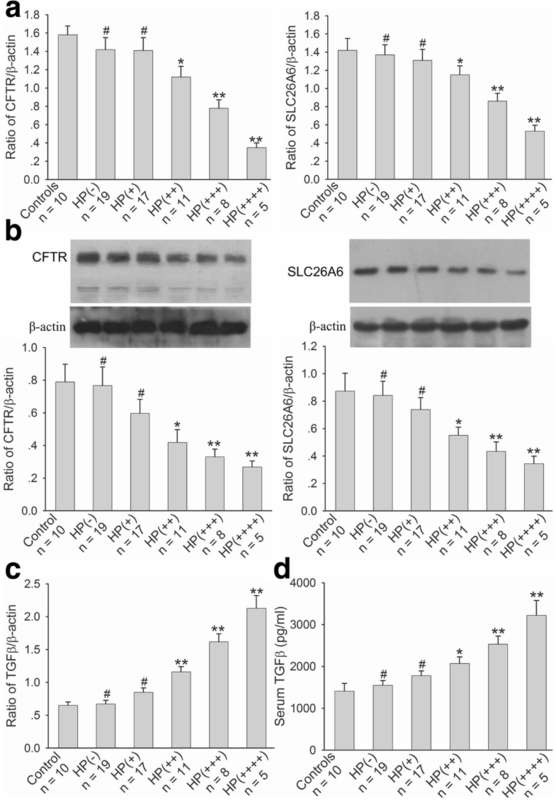 These results demonstrate that H. pylori infection decreases duodenal mucosal CFTR and SLC26A6 expressions and increases duodenal mucosal TGFβ expression, implying that duodenal mucosal CFTR and SLC26A6 decreases may be related to duodenal mucosal TGFβ increase. We further selected human duodenal epithelial cells, SCBN, to do experiments and investigated the effect of H. pylori on CFTR and SLC26A6 expressions and TGFβ production in duodenal epithelial cells. As shown in Fig. 2, after incubation with SCBN cells for 24 h, H. pylori induced significant decrease of CFTR and SLC26A6 protein expressions in SCBN cells at a MOI value of 200 in comparison with controls and induced the maximal decrease at a MOI value of 400 (Fig. 2a). In addition, H. pylori induced TGFβ production increase in SCBN cells MOI-dependently. Likewise, H. pylori induced significant TGFβ production increase in SCBN cells at a MOI value of 200 in comparison with controls and induced the maximal increase at a MOI value of 400 (Fig. 2b). Forskolin, adenylate cyclase activator, is a known CFTR activator and stimulates duodenal mucosal bicarbonate secretion through CFTR, whereas PGE2 is believed to stimulate duodenal mucosal bicarbonate secretion mainly through SLC26A6 . The further results showed that forskolin- and PGE2-stimulated bicarbonate secretions were markedly decreased in H. pylori-infected SCBN cells in comparison with controls (Fig. 3). 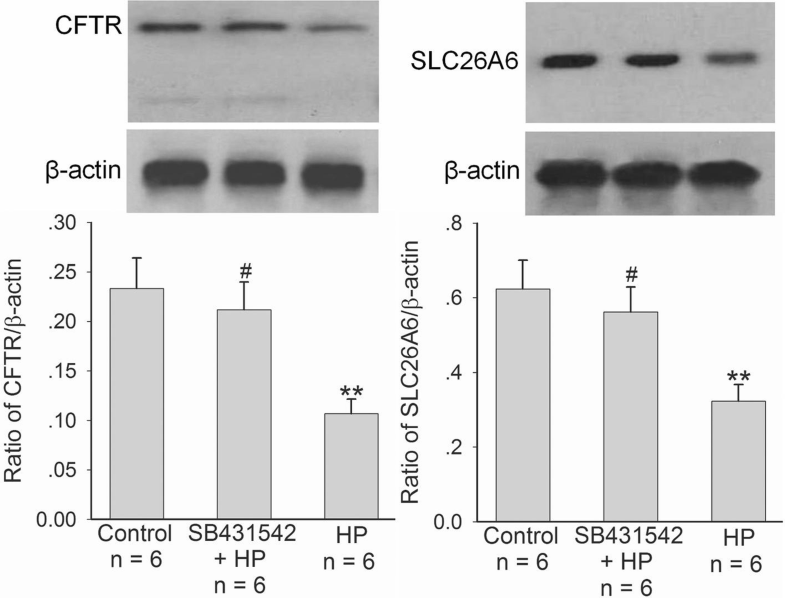 TGFβ inhibitor SB431542 (10 μM) reversed H. pylori-induced CFTR and SLC26A6 protein expression decreases in SCBN cells (Fig. 4). 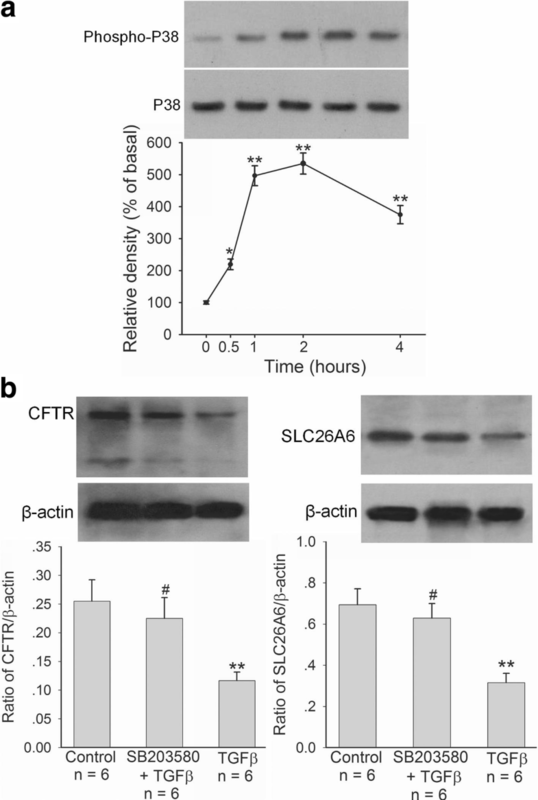 These results indicate that H. pylori infection downregulates duodenal epithelial cellular CFTR and SLC26A6 expressions through TGFβ signaling. We further investigated whether TGFβ could regulate CFTR and SCL26A6 expressions in duodenal epithelial cells directly. As shown in Figs. 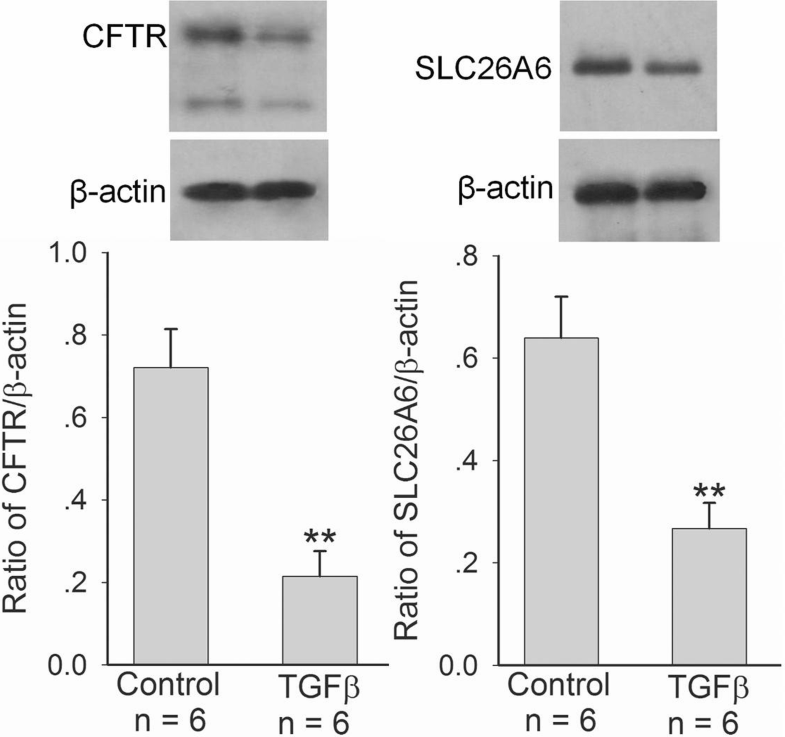 5 and 6, after TGFβ (5 ng/ml) incubated with SCBN cells for 24 h, CFTR and SLC26A6 protein expressions (Fig. 5) and forskolin- and PGE2-stimulated bicarbonate secretions (Fig. 6) in SCBN cells were markedly decreased in comparison with controls. The further results showed that TGFβ (5 ng/ml) induced the phosphorylation of P38 mitogen-activated protein kinase (MAPK) in SCBN cells after incubation with SCBN cells for 0.5 h and the maximal response was reached at 2 h (Fig. 7a). P38 MAPK inhibitor SB203580 (10 μM) markedly attenuated TGFβ-induced CFTR and SLC26A6 expression decreases in SCBN cells (Fig. 7b). The results demonstrate that TGFβ downregulates duodenal epithelial cellular CFTR and SLC26A6 expressions through P38 MAPK signaling pathway. Duodenal mucosal bicarbonate secretion is the most important protective factor against acid-induced duodenal mucosal injury. In this study, we provide evidence that H. pylori infection downregulates the expressions of two key bicarbonate transport proteins, CFTR and SLC26A6, in duodenal epithelial cells through TGFβ-mediated P38 MAPK signaling pathway. H. pylori is a Gram-negative bacterium and more than 50% of people were infected with H. pylori in the world . It has been demonstrated that H. pylori infection is a major cause of duodenal ulcerogenesis [1, 3, 4]. However, the mechanisms whereby H. pylori infection causes duodenal ulcerogenesis are not completely understood. Previous studies revealed that H. pylori influenced duodenal mucosal bicarbonate secretion which might be involved in the pathogenesis of H. pylori-associated duodenal ulcer [7–9]. Our recent study further revealed that H. pylori infection downregulated CFTR and SLC26A6 expressions in human duodenal mucosal epithelial cells and the CFTR and SLC26A6 expression decreases were related to the severity and virulent factors of H. pylori infection . But, how H. pylori influences CFTR and SLC26A6 is not clear. Several pathogenic mechanisms, including H. pylori virulence factors and host factors, have been associated with H. pylori-induced gastroduodenal diseases. In particular, the immune response against H. pylori virulence factors might provide a linkage to the development of gastroduodenal diseases [22–24]. Cytokines have long been considered as the main mediators of the immune response to H. pylori infection, which could modulate various intracellular signaling pathways and reprogram host gene expression [25, 26]. In this study, we hypothesized that H. pylori might regulate duodenal CFTR and SLC26A6 expressions through cytokines. First, we selected cytotoxin-associated gen A (CagA)- and vacuolating cytotoxin A (VacA)-positive H. pylori strain to establish murine H. pylori infection model. We found that H. pylori infection downregulated duodenal mucosal CFTR and SLC26A6 expressions in mice, which depended on the severity of H. pylori infection. On the other hand, H. pylori infection induced the increase of serum TGFβ level and duodenal mucosal TGFβ mRNA expression in the mice, which also depended on the severity of H. pylori infection. It suggested that a correlation might exist between CFTR and SLC26A6 expressions and TGFβ in duodenal mucosa. We further selected SCBN cells to perform experiments, because SCBN cells are nontransformed duodenal epithelial cells derived from humans and widely used for the study of bicarbonate secretion [14, 27]. The results showed that H. pylori increased TGFβ production and decreased CFTR and SLC26A6 expressions in SCBN cells, which depended on multiplicity of infection of H. pylori. Moreover, forskolin- and PGE2-stimulated bicarbonate secretions were markedly decreased in H. pylori-infected SCBN cells in comparison with controls. It has been demonstrated that forskolin stimulates duodenal mucosal bicarbonate secretion through CFTR and PGE2-stimulated duodenal mucosal bicarbonate secretion is SLC26A6-dependent . The results further supported that H. pylori decreased duodenal epithelial cellular CFTR and SLC26A6 expressions. Further results showed that TGFβ inhibitor SB431542 reversed the H. pylori-induced CFTR and SLC26A6 expression decreases. After incubation with SCBN cells for 24 h, TGFβ directly decreased duodenal epithelial cellular CFTR and SLC26A6 expressions by itself and forskolin- and PGE2-stimulated bicarbonate secretions were also markedly decreased in TGFβ-treated SCBN cells in comparison with controls. Taken together, these results demonstrate that H. pylori downregulates duodenal epithelial cellular CFTR and SLC26A6 expressions through TGFβ signaling pathway. TGFβ is a multifunctional cytokine that exerts a wide range of biological activities. TGFβ signaling regulates many different cell functions and critical cellular processes. Changes in cellular behavior are governed by activation of TGFβ rectors which triggers subsequent signaling pathways that change gene expression [28, 29]. Previous studies have provided evidence that TGFβ downregulates CFTR expression in polarized T84 human colonocytes and in primary human-airway epithelial cells [30–32]. As a cytokine, TGFβ can be induced through a number of cell types, such as macrophages and lymphocytes. H. pylori infection can cause the activation of immune cells, including macrophages, T cells, and B cells, leading to the production of cytokines. Previous studied have revealed that serum TGFβ level is elevated in patients with H. pylori-associated gastritis and peptic ulcers, in comparison with H. pylori-negative patients . TGFβ mRNA expression is significantly increased in gastric mucosal biopsies of H. pylori-infected patients in comparison with H. pylori-uninfected patients . In one study, H. pylori-secreted soluable proteins stimulated TGFβ production in gastric and colonic epithelial cells . These studies indicate that H. pylori infection induces TGFβ production increase and TGFβ signaling might be involved in the pathogenesis of H. pylori-associated gastroduodenal diseases. In this study, our results showed that H. pylori infection increased TGFβ production and decreased CFTR and SLC26A6 expressions in duodenal epithelial cells. TGFβ inhibition reversed H. pylori infection-induced CFTR and SLC26A6 expression decreases, which demonstrates that H. pylori infection downregulates duodenal mucosal epithelial cellular CFTR and SLC26A6 expressions through TGFβ signaling, revealing the potential etiological role of TGFβ in H. pylori-associated duodenal ulcer. How does TGFβ regulate duodenal mucosal epithelial cellular CFTR and SLC26A6 expressions? TGFβ is a complex signaling molecule that is activated when TGFβ binds to the TGFβ receptors, then leading to the activation and phosphorylation of the downstream mediators Smad proteins and regulating the expression of target genes in cooperation with other transcription factors, co-activators and co-repressors [28, 36]. In addition to Smad-dependent signaling, the binding of TGFβ to its receptors also activates many noncanonical signaling pathways, including p38 MAPK, external signal-regulated kinase (ERK), and c-Jun N-terminal kinase (JNK) signaling pathways [37, 38]. In this study, our results showed that TGFβ induced the phosphorylation of P38 MAPK in SCBN cells and the inhibition of P38 MAPK reversed the TGFβ-induced CFTR and SLC26A6 expression decreases in SCBN cells, which demonstrates that TGFβ downregulates CFTR and SLC26A6 expressions in duodenal epithelial cells through P38 MAPK signaling pathway. The findings from this study demonstrate that H. pylori infection downregulates duodenal epithelial cellular CFTR and SLC26A6 expressions through TGFβ-mediated P38 MAPK signaling pathway. CFTR and SLC26A6 are the two key bicarbonate transporters responsible for duodenal mucosal bicarbonate secretion. This study clarifies the mechanism whereby H. pylori infection induces duodenal epithelial cellular CFTR and SCL26A6 expression decreases and contributes to further elucidating the pathogenesis of H. pylori-associated duodenal ulcer. This work was supported by National Natural Science Foundation of China to B. Tuo (81160054), G. Wen (81460112), and P. Song (81272675 and 81570575). The funding body had no role in the design of the study and collection, analysis, and interpretation of data and in writing this manuscript. All data generated and/or analysed during this study are included in this published article. The raw data used and/or analysed during this study can be found in the computer of our laboratory, which are available from the corresponding author on reasonable request. GW, SD, WS, the acquisition and analysis of the data; HJ, JX, XL, RX, the acquisition of the data; PS, analysis of the data; BT, design of the study, analysis of the data, writing of the manuscript. All authors have read and approved the manuscript, and ensure that this is the case. The animal experiments were approved by the Experimental Animal Ethics Committee of Zunyi Medical College and conducted in accordance with principles stated in the Guide for the Care and Use of Laboratory Animals (NIH publication 8623, National Institutes of Health, Bethesda, MD, 1985).